Click the "Merge Calendars" command on the Tools menu. The Merge Calendars tool can be used to merge one of more calendars into a single calendar. Use the "Merge Calendars" command on the Tools menu to open the Merge Calendars window. 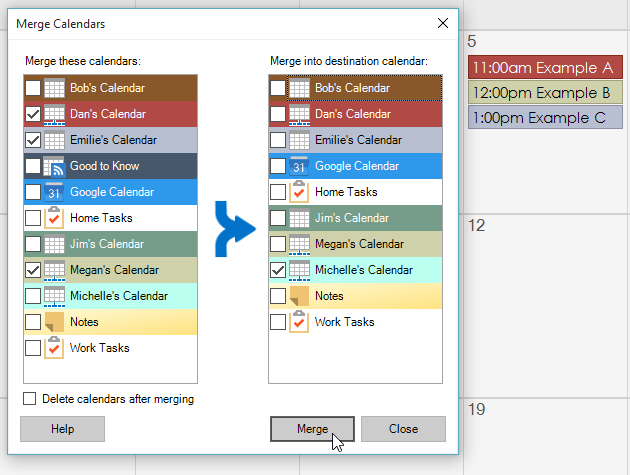 The Merge Calendars window will list calendars on the left and right. Use the checkboxes in the calendar list on the left side of the window to select which calendars should have their events, tasks, or notes reassigned. A single destination calendar can be checked in the list on the right. Read-only calendars will not be listed. After the source and destination calendars have been selected, the Merge button will become enabled. There's also an option to delete the source calendars after their items have been merged, since those calendars will be empty. If you don't want the calendars to be deleted, make sure to uncheck the "Delete calendars after merging" box. In the example below, three calendars (Dan's Calendar, Emilie's Calendar, and Megan's Calendar) are selected to be merged into a single calendar (Michelle's Calendar). The calendars will be merged after clicking the Merge button. You might notice task and note calendars are also listed. It's possible to merge an event calendar into a task calendar (or note calendar) - or vice versa. For example, if you decide you don't like having a separate task calendar and want everything in a single event calendar, the task calendar can be merged into the event calendar. All the tasks will be converted into events. The capability to convert between events, tasks, and notes is also provided via the right-click "Assign to Calendar" command for selected items.